Animal Adventures: Tales of Dungeons and Doggies are miniatures that bring canine adventurers to any tabletop gaming campaign! This box contains a set of six finely detailed miniatures. 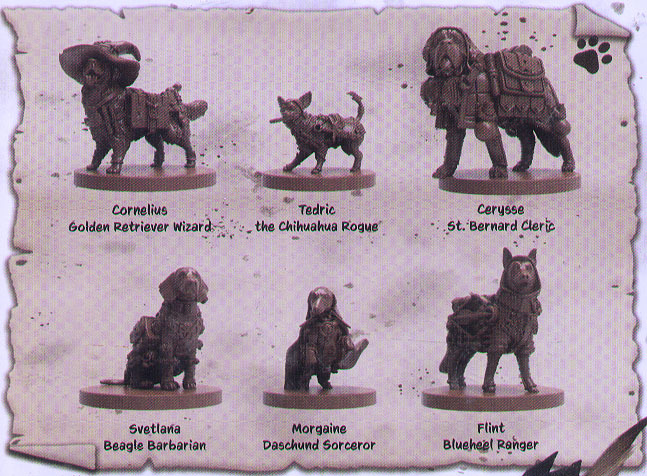 Each miniature lovingly depicts a canine adventurer bursting with character! Sir Cornelius leads his group of noble allies into many dangers in their quest for knowledge and adventure, ably assisted by the cunning sorcerer Moraine, feisty rogue Tedric, Flint, the wily ranger, stoic barbarian Svetlana, and protected by Cerysse, noble cleric of the Good Mother.